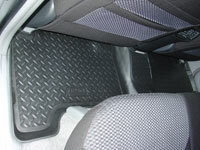 I have purchased front, rear and cargo area floor liners and installed them day 1 upon receiving the vehicle. I chose to go with the Husky Liners brand in Black. They are available in Tan or Grey as well. I prefer these to competing brands for a few reasons. I have had these in my 1999 4Runner for 8 years with no issues whatsoever. They do not appear to be as slippery/plasticy as other brands. I like the fact that they do not have deep grooves in them making it very easy to quickly wipe down, without needing to remove them from the vehicle and completly hose them off. 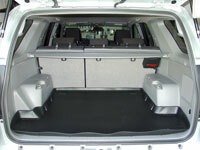 They completly cover the driver side foot rest. 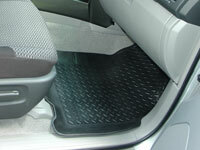 They do not have holes in them for the driver side floor clips, but rather they have stay put nibs (SPiN) on the bottom, which make it so that the mats do not move around at all. You can still flip up/down the rear seat garbage bag holder with the liner in place. Husky Liners are made of a rubberized thermo-plastic material. The patented rubberized material is resistant to water, mud, snow, and most chemicals including gasoline, oil and battery acid. Warranty guaranteed not to crack or break. 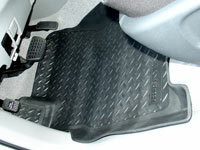 These are a great in protecting the truck's light grey/stone colored carpeting, especially in the winter. 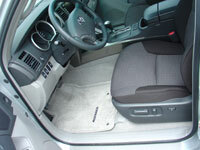 The second seat mats for the 4th generation 4Runner are now one piece construction as opposed to two piece in the 3rd gens. 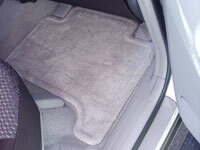 The benefit being that they look seemless and let no dirt onto the carpeting. 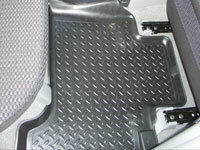 The drawback is that it is more cumbersome to quickly remove and hose off while not spilling any dirt onto the floor. 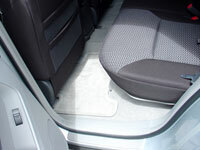 The rear mats do need to be trimmed a little if you have power seats. They come with instructions and are clearly marked where to cut. 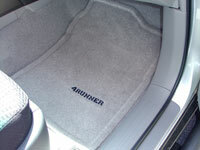 Having these floor liners, I very rarley have to vaccum my interior. 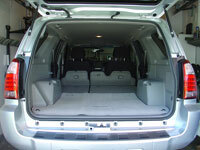 Each time I wash my vehicle I simply wipe down or hose off the liners, dry and put back. 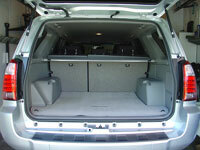 This is one of the best things you can do to protect your interior.